Spoilers below so beware if you haven’t seen this episode yet. It’s just TV, I know. But it’s good TV. It’s been a weekend ritual in our house so no matter what it brings, we take it without blinking. Well, in a manner of speaking of course. Because we all know what happens when you blink. Doctor Who. There’s a sadness about it, but there’s also so much beauty. I never thought I’d feel the same way I did when Doomsday happened. You were there, you know what happened! We were all with Rose when she looked on at the untouchable image of her beloved Doctor, helpless and lost for words. She did manage to say the most important words in the end, and he…well you know how that ended. And then, New York five years later. 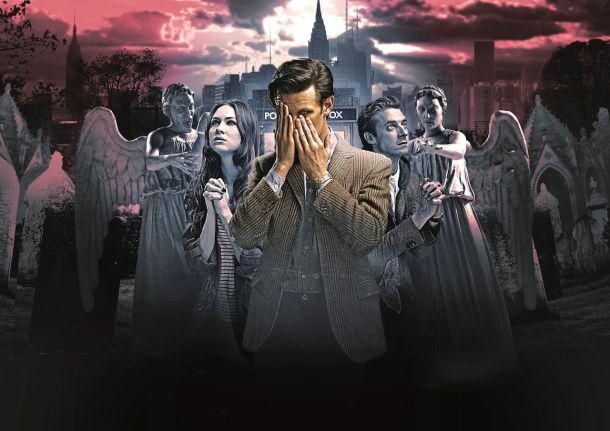 Just when you thought everything was all right in the world again because of the paradox that Amy and Rory created when they jumped off that building, a lone survivor made sure what’s written in stone remained unchanged. And Lady Liberty as a giant screaming angel? Good luck, NY! No wonder you never sleep! This Doctor is at the lowest point of his entire existence. He tried so desperately to hang on to Amy and Rory, blundering his way through space and time with them to prolong the inevitable. This too shall end. No wonder the TARDIS is blue! The Doctor’s two hearts are broken. Idris feels the pain her thief feels. There are a few memorable moments in this final episode with the Ponds. The Doctor’s emotions are in full view the entire time. If he was able to use his smile before to hide whatever was in his hearts, this time he didn’t care that his emotions were on show. Reading that final chapter on Melody Malone’s book and his anger at himself for having done so. Unable to un-read, to undo what he has seen. The Doctor’s anguish at the exact point when he realized what Amy was prepared to do to be with Rory, and then when it finally happened. It was heartbreaking. Amy’s unmatched courage and loyalty. Stepping up on the ledge to be with Rory. Saying goodbye to her Raggedy Man. And that bittersweet moment between mother and daughter when Amy commends the Doctor to Melody, steeling herself for what she was about to do and finally accepting her fate. The afterword from The Girl Who Waited was a beautiful way to come full circle on the story of the Ponds. And as if that wasn’t enough, I stayed up and watched the season premier of Grey’s Anatomy! Yes. More death. More pain. More crying.